I recently saw Planned Parenthood ReTweet this article (linked below) and I stared in disbelief. This is part of the insanity of abortion, that someone would try to make an argument for abortion by talking about the rights of children yet to be born. Future generations must have the right to abort their children, even if they don’t have the right to exist. In this mindset, the right not to be pregnant trumps the right not to be killed. But evidently we do have some responsibility to future generations? Are we responsible to them? We need to protect their rights? On what basis? Which rights? 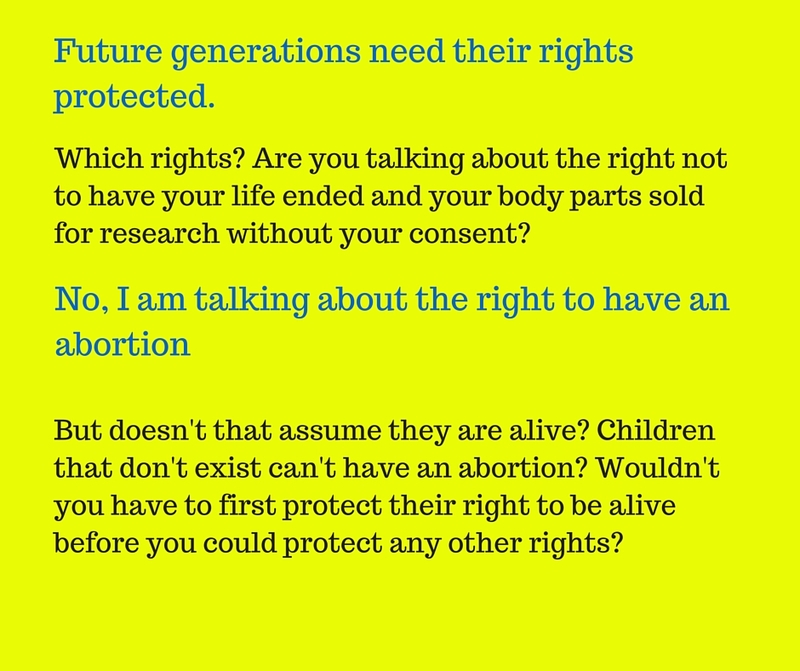 If we don’t protect their rights, what happens? “Will our daughters, sons and young neighbors have the same reproductive rights we have? Only if advocates of chosen childbearing tap the deep moral roots and emotions beneath abortion care. Again, note the argument. We should be able to terminate a life in order to make sure that other lives are healthy. It sounds caring, but it is diabolical. Can you imagine if this ethic was applied to any other element of healthcare? If you’re not healthy, we’ll put you down like a dog at the vet. (Which by the way, we should note that dogs have more rights than unborn children. You cannot inflict any pain on an animal while euthanizing it. Not so with children.) That ethic may work for animals, but not for humans. This sounds like a soft expression of eugenics to me. Taking the life of sick people in order to improve the lives of everyone else is BAD MEDICINE. I’m generally pro-choice but morons like you should have been aborted. Is it too late?